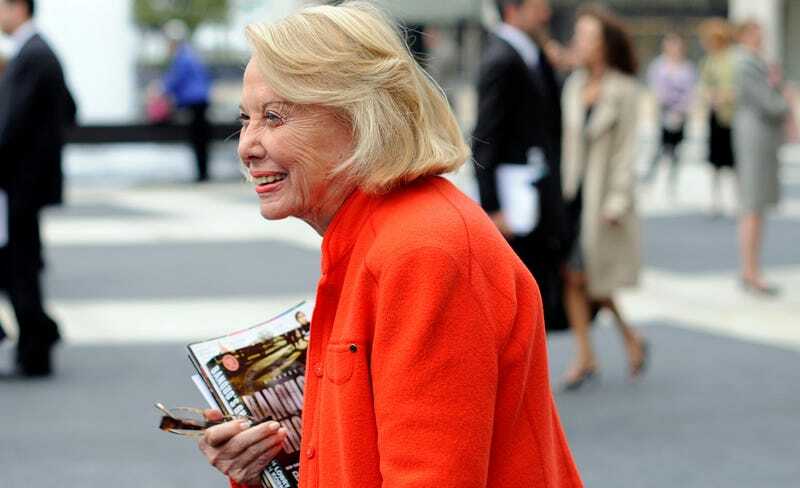 Liz Smith, gossip column queen, frequently referred to as “The Grand Dame of Dish” or “The Doyenne of Dish,” passed away from natural causes in New York on Sunday at the age of 94. Smith’s friend and literary agent, Joni Evans, confirmed her death to the Associated Press on Sunday. Smith was born in Fort Wort, Texas in 1923 and got her degree in journalism from the University of Texas at Austin in 1949. In the 1950s, she got her start in professional gossip-mongering writing an anonymous column for the Hearst papers. In the 1960s, Smith went on to work under Helen Gurley Brown, as Cosmopolitan’s US entertainment editor. Smith’s New York Daily News column, demurely titled “Liz Smith,” ran from 1976 to 1991, before migrating to New York Newsday from 1991 to 1995, then on Newsday until 2005. Smith also wrote a column for the New York Post from 1995 to 2009 that was syndicated for several of those years in 60 to 70 newspapers, the New York Times reports. Smith was also a TV fixture in various capacities over the years. While working at the NYDN she was featured in daily segments that appeared on WNBC’s Live at Five newscast, an 11-year stint that garnered her an Emmy in 1985. During her tenure at the Post, Smith also made appearances on the Fox News Channel. Celebrities, fellow writers, and fans paid tribute to Smith on Twitter.